On a serene 52-acre hilltop in Kensington, Maryland, the Washington DC Temple creates an impressive sight for travelers along the Capital Beltway. The 16th operating temple of The Church of Jesus Christ of Latter-day Saints serves Church members in Washington, DC, Virginia, Pennsylvania, Maryland, Delaware, West Virginia and New Jersey. The Washington DC Temple was the first Latter-day Saint temple to be built on the East Coast of the United States. When the temple was completed in 1974, it served all Latter-day Saints living east of the Mississippi and all Latter-day Saints in South America. At 160,000 square feet, it is the third largest temple in the world. It contains instruction rooms and sealing rooms, where marriages are performed. 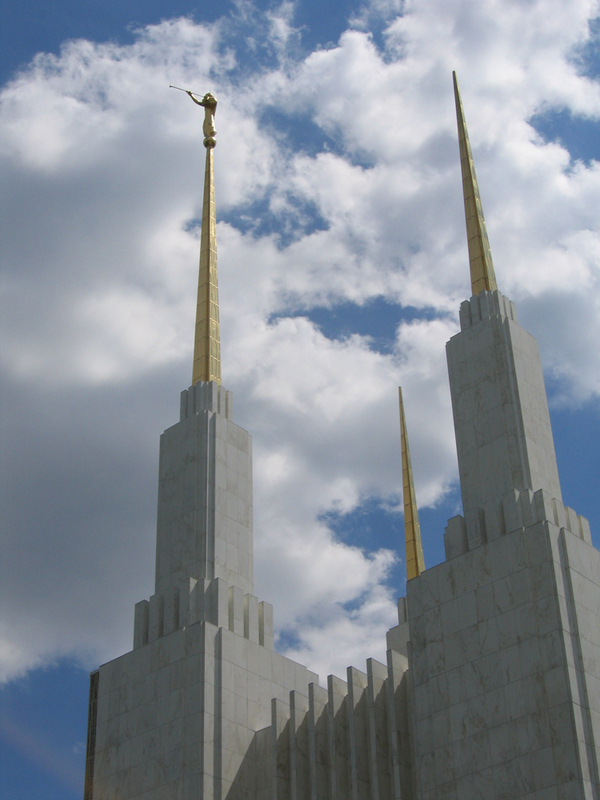 Latter-day Saint architects Harold K. Beecher, Henry P. Fetzer, Fred L. Markham and Keith W. Wilcox designed the Washington DC Temple in a collaborative process. Each offered designs for review and critique, which were approved by the Church’s First Presidency. Through this process, the final design emerged representing the best ideas of each architect. This temple, which the architects described as a building of “beauty, significance, and distinction,”1 took shape as an elongated diamond with towers on the corners. On the east side of the temple, the central tower reaches a height of 288 feet, making it the tallest spire on a Latter-day Saint temple anywhere in the world. The three spires on the east and the three on the west represent two branches of Church leadership, the Aaronic and Melchizedek Priesthoods. The six-spire design echoes the design of the Salt Lake Temple. An 18-foot-tall sculpture of angel Moroni created by Avard Fairbanks graces the tallest spire. The statue, cast in bronze and covered in gold leaf, was the third to be placed on a temple. Fairbanks portrayed the angel Moroni lifting a trumpet to his lips and holding golden plates in his left arm. Latter-day Saint sculptor Franz Johansen created 16 bronze medallions — eight of which decorate the temple gates and eight of which decorate the temple doors — illustrating the sun, moon, and stars, among other designs. The temple is finished with 173,000 square feet of Alabama white marble, which is cut to a thickness of ⅝" in some places, allowing sunlight to filter softly through the walls. Faceted windows of colored glass ascend the east and west ends of the temple. These seven-foot-wide panels rise in red and orange hues, softening to blue, violet and eventually white as they reach the top. One of the architects noted the symbolism of the change in colors — purity comes with aspiring toward heavenly things. A similar progression from color to white and gold can be seen in the interior furnishings of the temple. 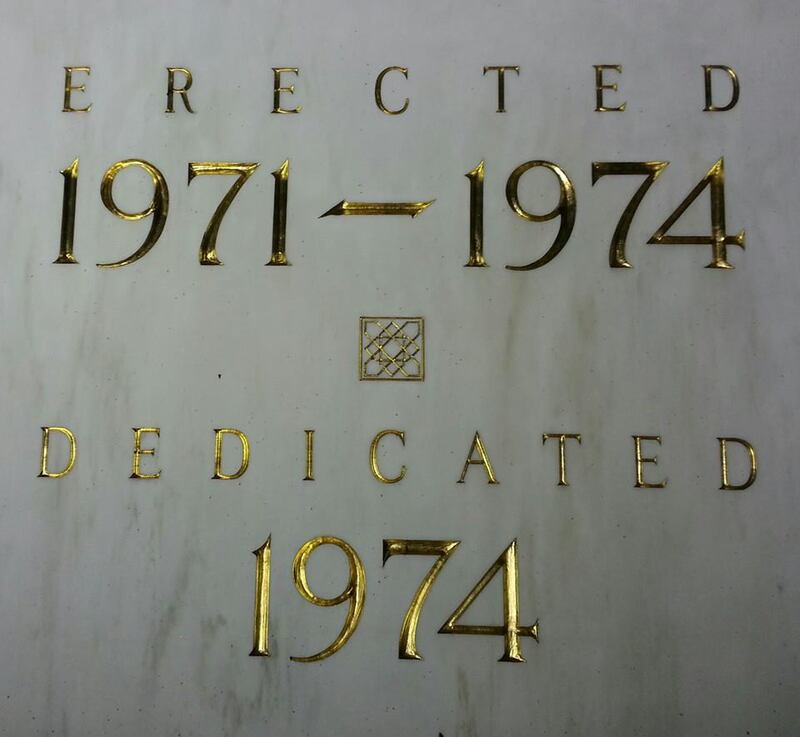 Nearly six years after the temple was announced on November 15, 1968, the temple was ready to be dedicated. The temple opened to the public from September 17 to November 2, 1974, and more than 750,000 visitors toured the building. High profile visitors, including Betty Ford, Gerald Ford’s wife, were among those who viewed the temple interior. On March 3, 2018, the Washington DC Temple closed for an extensive renovation. The building will receive considerable upgrades to its mechanical system and the finishes and furnishings will be refreshed. There will also be changes to the landscaping and a small addition to the exterior to enclose a new elevator system and stairs. The project is expected to be completed sometime in 2020. 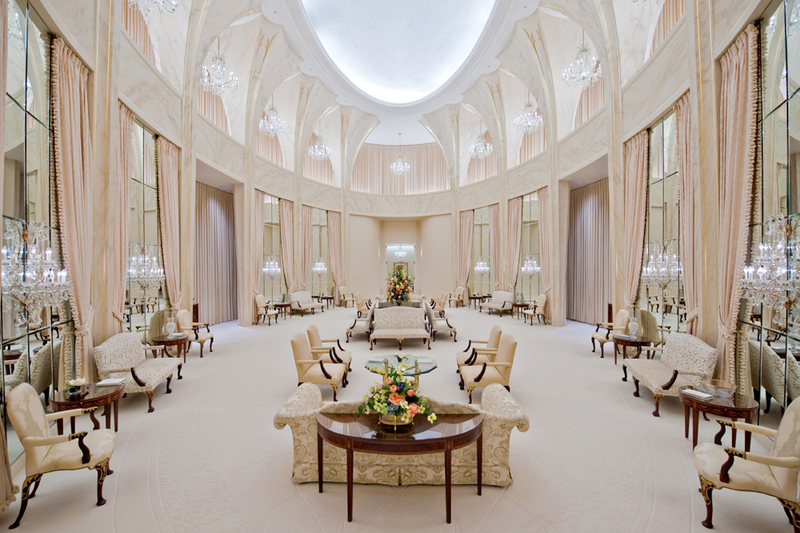 Following the remodel, the public will be able to tour the temple during an open house. Adjacent to the temple, the Washington DC Temple Visitors’ Center provides the opportunity for visitors to learn more about temples and the Church’s teachings. The visitors' center will remain open throughout the renovation. The annual Festival of Lights in December will also continue, although the display may be impacted by the construction. 1 In “To Build a Temple,” Ensign, Aug. 1974, 16. 2 “President Kimball Dedicates Temple,” Ensign, Feb. 1975, 81.